27 year-old Fremont resident, Allan Hsu charged with three counts of attempt murder in March 30th shooting incident. On Friday, March 30, 2018, at 2:47 a.m., Fremont dispatchers received a 911 call reporting a shooting incident at a shopping plaza on the 3900 block of Decoto Rd. Fremont patrol officers were immediately dispatched and arrived in less than two minutes. Upon their arrival, officers located three intended victims, who were fortunately not injured. Officers then secured the crime scene, began collecting victim and witness statements, and located evidence at the scene. Based on victim statements, it appeared the incident initially began as a verbal argument between the involved parties while in a drive-thru restaurant food line. The suspect initially left the shopping plaza but returned approximately five minutes later. The suspect drove up to the victim’s vehicle and fired 12 rounds striking the vehicle in multiple locations. After the shooting, the suspect fled the area at a high rate of speed. Detectives from the Fremont Police Department’s Investigations Unit, Street Crimes Unit, Special Investigations Unit, and patrol officers made coordinated efforts to locate the suspect vehicle and suspect. Video surveillance was obtained from surrounding businesses along with community-based video surveillance cameras and automated license plate reader systems, which provided a description of the vehicle and suspect. Within 6 hours, police personnel located the suspect vehicle in the 35000 block of Magellan Drive. At approximately 1:10 p.m., surveillance was set up on the vehicle and soon officers observed a male matching the suspect description (Allan Hsu) walk towards the suspect vehicle. Hsu was positively identified and subsequently arrested by members of the Fremont Police Department’s SWAT Team. A search warrant was served at Hsu residence and various items of evidentiary value were seized, including several firearms and ammunition. Additional physical evidence tied Hsu to the shooting. 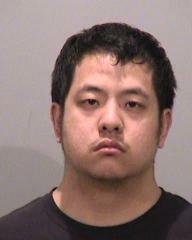 Hsu was booked into Fremont Jail for attempted murder. On April 2, 2018, the case was submitted to the Alameda County District Attorney for review and charging. Allan Hsu (27 year old, Fremont resident) was charged with three counts of PC 187/664 – attempted murder, one count of PC 246 – willful discharge of a firearm at an occupied vehicle and an arming clause (use of a firearm). Hsu was arraigned in the case on April 2, 2018 at the Fremont Courthouse. Anyone with information about this case is asked to please contact Fremont Detective Brent Butcher at (510) 790-6800 or Bbutcher@fremont.gov. We also accept anonymous tips. Please text TIP FREMONTPD followed by your message to 888-777, or via the web at https://local.nixle.com/tip/alert/6216337.